This new cottage-style home features a kitchen designed to be both functional and aesthetically pleasing to accommodate large family-and-friend gatherings. 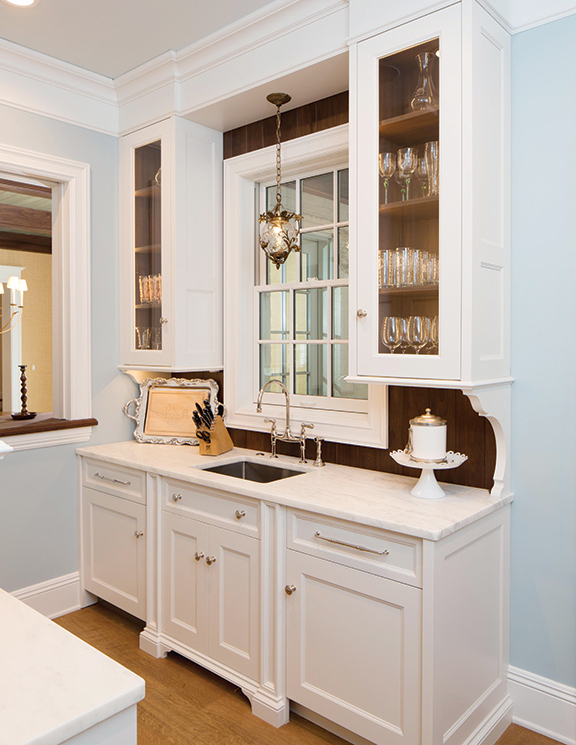 The adjacent butler pantry played a key to the function of the design by Gegg Design & Cabinetry. It was important to keep the main kitchen area feeling in scale with the other rooms. The butler pantry helped to achieve this, and the entry is directly adjacent to the main work area. A pair of 30” refrigerators with freezer drawers flank the pantry entrance. They are recessed into what looks like a thick wall between the kitchen and butler pantry. The remaining space on the wall features tall, glass upper cabinets in a white-painted finish with lighted interiors. Flanking the hood are two large wall cabinets with horizontal doors at the top to break up the tall height. The trim detail was designed to be integral to the beams of the kitchen. The butler’s pantry features a counter landing area. The T-shaped pantry design has a full-size sink, dishwasher, trash/recycling, refrigerator drawers and ice maker. The unique feature of the pantry is a pair of retractable doors above a decorative mullion-glass front-lighted display cabinet that opens to the formal dining room. For larger events it can be used to serve drinks, but it can also be closed up preserving the formal dining room environment when not in use. Creating the butler pantry as a separate room is a brilliant design decision. This kitchen is comfortable, yet rich and timeless. 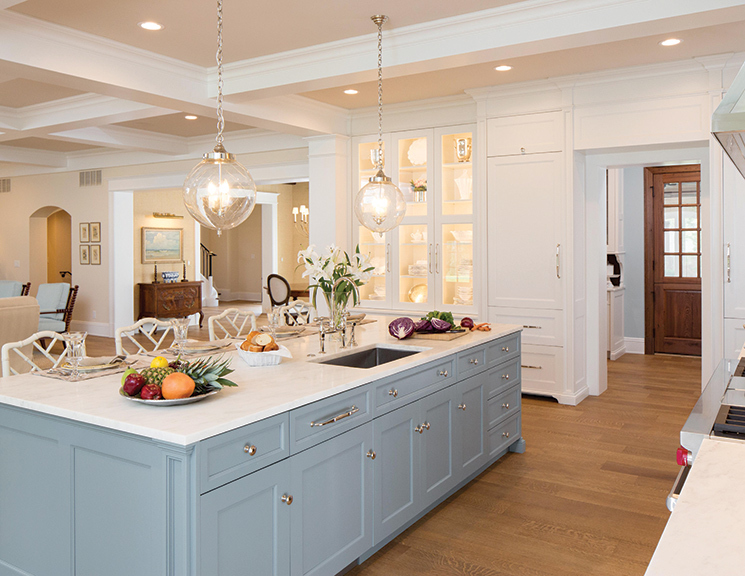 The subtle island color is a nice contrast to the white cabinetry.